Join an intimate circle of seekers on a sacred journey in the footsteps of Mary Magdalene as we embark on a once in a lifetime experience that weaves together the outer radiant beauty of Provence with the deep call to the contemplative life. Through myth, history, art, music, ritual, nature, prayer, personal reflection, community building and sharing in the intimate company of fellow pilgrims, the Mythica Foundation invites you to step into an adventure of awakening, transformation and wonder. We begin our pilgrimage in Marseille, where French legend holds that Mary Magdalene arrive in 41 AD.Upon arrival you will be transferred by comfortable coach to a beautiful Relais et Chateaux hotel, an oasis of calm and tranquility nestled at the foot of the majestic Massif of Sainte-Baume. We will then gather in the salon for a ritual of our intentions for the week and to create together a contemplative Vespers service of poetry, silent meditation and music. This evening will be our first taste of the cuisine of Provence (created by renowned chef Emmanuel Mercadier) as we dine in the candlelit courtyard with the sounds of doves and a water fountain nearby. In the beautiful summer light, we will gather for a morning service to welcome the day, interweaving Medieval chant, silent meditation and poetry. After a bountiful breakfast, we will gather for a day of lecture, art and journaling. A slideshow of 333 images will reveal how Mary Magdalene carries the archetype of Everywoman, representing our full humility in both grief and joy, depicted representing every age, race and emotion. We'll explore Mary Magdalene as the courageous disciple of early Christianity and the wisdom of her teaching in theGospel of Mary. We'll trace how Magdalene's image shifted in the 6th century as the myth of the penitent prostitute was adopted and spread by Pope Gregory the Great, and we'll compare that with the early Provencal legends of Magdalene as a contemplative teacher who preached throughout France. The afternoon is free for a nourishing nap, invigorating swim in the luxurious pool or a relaxing massage. Today, we will focus on how Mary Magdalene calls us to the inner life. 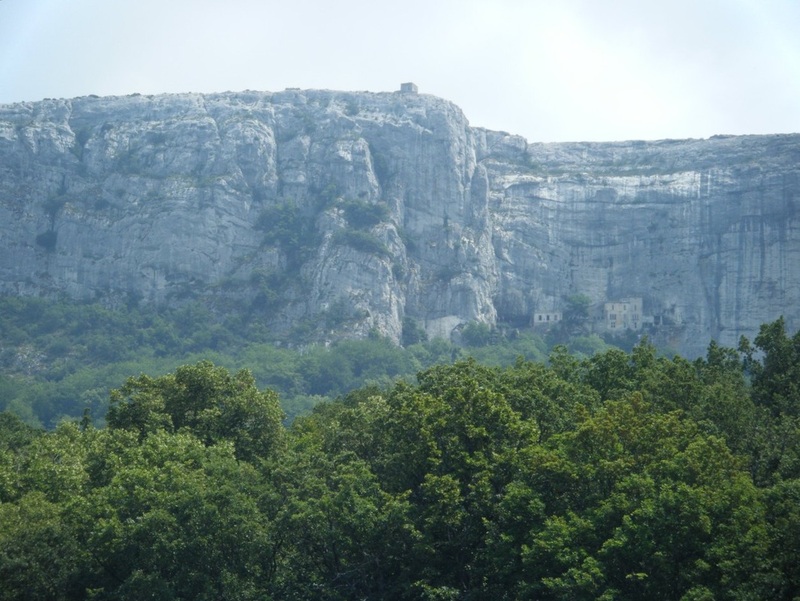 We will travel by mini-bus for our first trip to La Sainte-Baume, her legendary last home. After attending a contemplative service in the pilgrim hostel at the base of the mountain, we will silently hike up the mountain – a journey that takes about an hour of fairly strenuous walking. We will pass through the verdant forest dedicated to the Greek goddess Artemis for 700 years before ascending the steep pathway trod by centuries of seekers in search of Magdalene’s grace-filled spirit. Inside the grotto where she dwelt for 30 years, time seems to stop. Here, we will be encouraged to journal to discover the still small voice within. Upon our return to Domaine de Chateauneuf, we will gather to create the first pages of our memory books. Our day will come to a gentle close as we settle into the soothing rhythms of Vespers and another delicious meal. We will explore the sensual wonders of the morning market in the small French village of Cotignac: the wafting fragrance of roses, lavender and lilies, the colorful trays of exotic spices, stalls of beautiful handmade soap, scarves and jewelry. We will gather roast chicken, chevre and fougasse (the local specialty of olive bread) for a picnic that we take to a scenic waterfall. In the afternoon, we will visit Thoronet Abbey, established as a Cistercian monastery by Bernard of Clairvaux in the 12th century, We'll learn about liturgical life and the balanced rhythm of study, work and prayer that developed following the Rule of Saint Benedict. We will marvel at the beauty of the extraordinary architecture based on sacred geometry and hear the stories of how the mystical devotion to the sacred feminine emerged in the 12th and 13th centuries. After chanting in the acoustically perfect chapel, we will return to another splendid meal, eaten in the courtyard garden of our lovely hotel. Today is a focus on the French Orthodox tradition of Mary Magdalene. We will visit St. Michel du Var, a contemporary monastery with joyous Byzantine style frescoes that depict the life, legacy and teachings of Mary Magdalene. We will see relics believed to be her hair and bones, and learn more about the "Boat of Bethany" that brought Magdalene, Lazarus and Martha to Provence. In the early afternoon, we will gather together for the Dance of Three, a heart-opening ritual of compassionate witnessing pioneered by Depth Psychologist Marion Woodman. On our last morning together, we will gather together in the garden of Domaine de Chateauneuf to watch the sun rise. As the rosy light spreads across the landscape, we will bless one another on our journeys and offer a ritual of gratitude to this extraordinary site that has held us so magnificently as we have come into our fullness. After one last delicious breakfast, you will be transferred to either the Marseille Airport or the Aix en Provence Train Station, carrying with you the gifts of this pilgrimage to share with those you love.